Rugosc is a non-contact sport combining the kicking, running and catching skills of a rugby full back and the goal -saving skills of a soccer goalkeeper. A game require two opposing teams, a ball and a field of play. Each team may comprise one or more players. There are no field positions in Rugsoc. 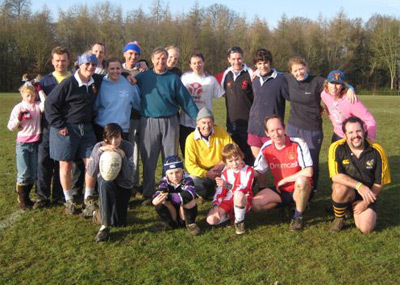 Teams prepare to play by facing each other in their own halves of the field as for a game of rugby, soccer or hockey. The team winning the toss chooses either to kick off or has choiceof ends. Changes of ends can be made at half-time, or quater-time every 15 minutes in an official WRA match when there are atleast three in a team. Doubles or singles matches are more physically demanding. When a shorter period of play, such as two halves of 15 minutes, is recomended. 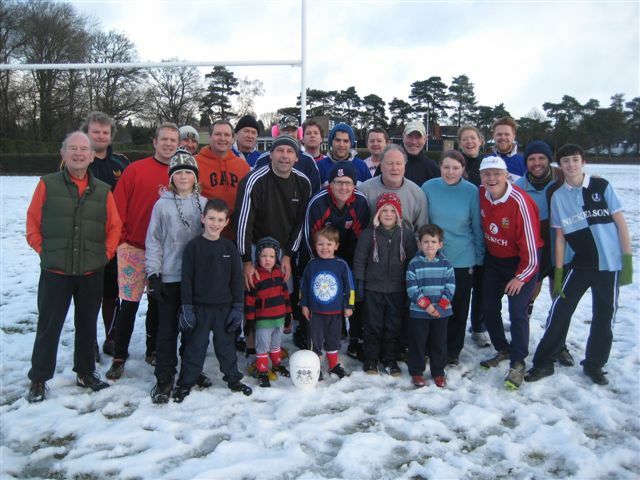 The kick off and all other kicks in rugsoc general play are by a punt or drop kick from the hand. A place kick is permitted only for penelaty kicks. (See note 10 PENALTY KICKS). Once the ball has been kicked, possesion passes to the other team which makes their return kick, and so on. team tries to get within goal-scoring range i.e. in their opponets's half of the field. Apart from the distance achieved by kicking , distance can be gained, or lost , by other means. ( SEE NOTE 9 GAINING OR LOSING DISTANCE). kick. Once the ball is in play, the other side gathers it as cleanly as possible in order to make their return kick No interfernce, such as tackling, is allowed on the player gathering the or when the return kick is made. return kick is allowed three paces forward as the kick is made. b) the player attempting to gather the ball, as in example 9a, fumbles the ball, knocking it forward, The player must re-gather the ball and make the return kick at the point where first contact was made, But if , after making contact, the ball should go behind the player, it must be kicked at the point where it is eventually re-gathered. c) the player gathering the ball succeds in catching it on the full, i.e. before it strikes the ground. This is 'Gain' (see Note 7 SCORING) After a successful catch , the player is permitted a 20-pace run before making the return kick. d) in attempting to catch the ball on the full , the player drops it . This is an 'Error' and the return kick is forefieted to the side which made the kick. This team moves up and one of their players takes another kick, either at the point where the dropped catch occured, or where the ball is gathered. e) the ball is kicked out of play over the touch line. This is an 'Error' and the distance made by the kick is forfeited to the other side which comes forward to take the return kick at the point where the original kick was made. defending team can take its kick from the 22 line or from the edge of the penalty area. forfeited, as in example 9d. team concedes a 'corner' . The attacking team takes another kick 15m in field fro the touch line on the 22 line /corner of the penalty area. i) the team gathering the ball cannot reach it before it stops moving. This is an 'Error' and the return kick forfeited. goal. ( a ball dropped in front of goal cuonts as an attempted 'save' incurring no penalty , as long as the ball remains in the field of play. See Note 9h). b) the ball is kicked from inside the 22/ penalty area out of play over the touch line or try/ goal line, or is not kicked out of the defending team's own 22/ penalty area. c) the team gathering the ball inside its own 22/ penalty area cannot reach it before it stops moving. 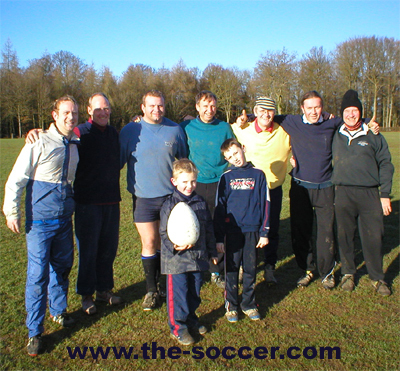 When the game is played with rugby posts, any number of players can crowed between the posts to try to make a save from a kick at goal. When soccer or hockey goal posts are in use, a maximum of two players can stand between the posts to try to make a save. Other members of the defending team must stand clear and not interfere with the next play. TERMS USED IN RUGSOC:The game has evolved using terms which have a common usage and those of a more traditional origin. Both are listed for the information of those seeking a complete knowledge of the game. printed above the coat of arms and WRA APPROVED is printed below it. Also printed on another panel is RUGSOC. And on another panel is printed DEL. Two of the five long panels are blank. DEXTEROUS EXPORT LINE and MOISTEN NEEDLE. though my team lost 4-9!